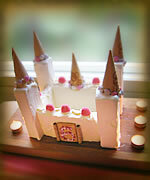 Build a robust ice cream castle - a royal cake idea for princesses and knights! 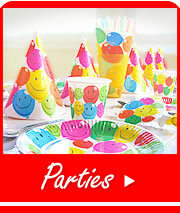 Decorate the towers with candies and the gate with sprinkles using sugar icing as glue. Let dry. 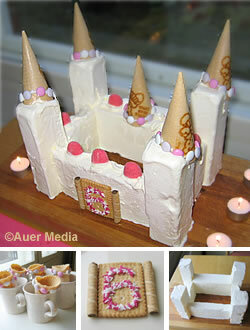 Build the castle shortly before the party begins or store it in a freezer. Use a whole block of ice cream as the back wall. Cut two blocks in two to make the towers. Cut the last block in two thin slices. Use the first part as the front wall and cut the other part to sides. Put the ice cream cones and the gate to their right places like in the picture. Serve the rest of the ice cream cones separately.